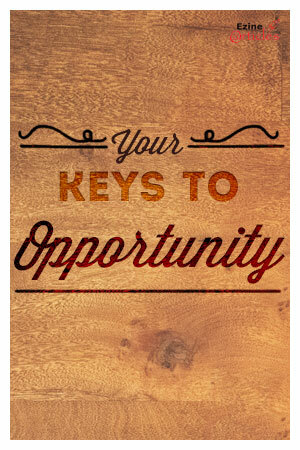 Your Key to Opportunity: Decide on your goals and the outcome you want to achieve. Create to-do lists and plan for the unexpected by reserving time to deal with it each day. Whatever you do: Write that article. Your articles are BORING. They regurgitate the same tips everyone else is delivering and they’re duller than [insert the title of the most boring book you’ve ever read]. Your articles should grab your readers’ attention by the lapels, lively shake them about with descriptive language, and move them with helpful advice they can apply to their lives. Your Key to Opportunity: Read outside of your niche and consider how it may relate or impact your topic. Learn something new to expand your skillset and experiences. Dredge up those old memories and consider how your audience can learn from your experiences. And don’t leave your audience hanging after delivering an insightful article: propose a call to action where a task or lifestyle change is recommended, and offer incentive when completed or embraced. Direct them towards something that may appeal to them that is original and that they can follow up on it with you. Nobody is perfect. When you get called out on a mistake and your credibility takes a hit, it can take a lot out of you. In writing, this can include grammatical errors, spelling blunders, or conflicting information. Your Key to Opportunity: Thoroughly check your articles (or anything written) before committing them. Get a second set of eyes on it to catch those tiresome errors. If an error is made public, cover your bases with grace and seal the wound. Accept the error with great humility, apologize for it, thank whoever brought it to your attention, correct it or amend it, and propose a healthy resolution for the future. Promoting isn’t always easy. You perform research so your promotion rolls over your audience like a wave of fresh air, rather than an unwanted tidal blast. Who’s your target audience? Are you only in your comfort zone or do you want to step out and test different waters? What worked in the past that is no longer an effective campaign? SO many questions! Your Key to Opportunity: Find out who your audience is – even if it’s your best guess – and then publish an article targeting them. Measure your audience’s response: consider the message, the tone, the place you placed the article, and much more. Get out there and test. Challenge yourself to leverage the best promotion strategy for your platform. Even in your proudest moment or achievement, there’s always a possibility of someone going after you. Some people like to get under your skin and slow you down when you’re almost at the top. You can even be heckled in front of others. Your Key to Opportunity: The worst thing you can do is ignore them, or let them feel like their thoughts don’t matter to you. Turn the tables and employ humor. Laughter can help soothe the attack and let the person know you’re confident in your stance and willing to negotiate to create a positive outcome for everyone involved. Ask them to propose a resolution to give them a sense of ownership. From there, you can negotiate a positive outcome. Technology can simply make the impossible possible. However, it can also cause a lot of stress and leave you hanging. We’ve all had that heart in throat moment when our computers have crashed after an hour’s worth of work and we pray that we saved recently or that all isn’t lost. What’s worse, when our websites decide to go on the fritz and prevents our visitors from interacting with our website. Your Key to Opportunity: First, always compulsively save and remain calm. If it’s lost, then you’ll just have to start over or change your strategy. No sense in losing your head over it. Secondly, there are dozens of free services you can sign up for to alert you when your website isn’t running smoothly. Many times, the first place people will go to find out if a website is down is on social media, so be sure to send out a message on those channels letting your audience know that your website is back and running. Most people are compassionate and understand the issues when you reach out to them. “[Jargon, jargon, and more jargon]. If you don’t do [jargon], then [more jargon]. That’s why you should [some more jargon].” What are you trying to say? No one wants to read an article or content that they can’t relate to or makes them feel like an idiot. Your Key to Opportunity: You’re the expert, but your audience may not be. Avoid regurgitating facts people can’t relate. Find common ground with your audience and connect on a broader approach by sharing relatable and relevant experiences while breaking down confusing content into terms your audience can understand. Keeping your readers engaged while effectively avoiding possible disaster can be hard work for the average writer. Check in with your audience personally to see what they’re currently interested in and ask for feedback to get a bird’s eye view of how they’re responding to your content. Take polls or surveys to keep on your toes and show your readers that they matter. Not only will your tips and advice brilliantly shine, but your commitment to excellence will too. How do you ensure you’re connected to your readers? Do you have any stories to share about having severed a connection with your audience and how your repaired it? Let us know – we’d love to hear from you! Hi Vanessa, this is great post! Every writers need to focus on content clarity. Jargon content does not make sense. Agreed 100%. I love writing in plain language to people. You get more perceived as an expert this way than speaking jargon terms to make yourself sound intelligent. “You may lose a battle here and there, but your commitment to get back up when you fall and improve your strategy will help you achieve a successful outcome.” Nice morale-boosting words for anybody who confronts a problem or failure. Good post indeed, to encourage authors. my site error 301 how can fix it. I definitely need to go baack and check that my links are still active… That 404 error is a bad turn off. So far I have not taken my audience over a cliff. If that happens, these tips will work wonders, I’m sure. Thanks. A blessed day EzineArticles and all! Thanks for the inspirational and somewhat cold-water-in-the-face article reminding us to be ever-vigilant and not get lazy when doing our work. I am just starting out as a writer. I have my first book (guitar method book for beginners)due out this month, and I have only submitted one article for review so far. I am facing the following dilemma. I would like to have a library of articles, videos, and general content available to demonstrate my expertise or at least participation in my field (of guitar teaching). However if my article sends people to view my website and my website is not clearly providing them with assistance to take my advice any further, then what’s the point? Can you suggest any way for me to have guidance in making my website a valuable resource to my intended audience? So I guess I am deliberating about timing – do I release an article before my book is released with the “just do it” mentality or do we bide my time and post once the book is for sale? I also don’t want to let fear of not doing it right stop me from doing it at all! Thanks goodness there is always a second chance, to make up for anything that might have gone wrong in your endeavor to establish a good relationship with your audience.